The Patton Electronics 2160 2160/EUI-2PK is the logical upgrade path for customers who have used the Patton 2157 Long Range Ethernet Extender kits. Both models use G.shDSL. The newer 2160 units feature a higher maximum data rate and multiple Ethernet Ports. Of course the Patton 2157 units still have their loyal following…with their smaller footprint and field proven reliability. We recommend and stock both products. The 2160’s are actually a little less expensive than the 2157’s. 4 x 10/100 Ethernet Switch—Make up to 4 network connections easily. Built in MDI-X auto cross over switches eliminates messy and confusing cable configurations. Transparent LAN Bridging—Passes higher layer protocols and supports 802.1Q VLAN tagging. Automatic Learning, Aging and Filtering—Only allows packets with addresses outside the LAN to be forwarded. QoS, CoS, and VLAN Support—Ensure mission critical network connections are of top quality with advanced traffic management features. WWW/SNMP Manageable—Built-in console port makes setup a snap, you can also use the embedded HTTP/SNMP agent to remote manage the unit from anywhere in the world. The Patton CopperLink Model 2160 Series simplifies and provides cost-effective network extension by utilizing pre-existing twisted pair infrastructure. LAN extension doesn’t have to be expensive or difficult. Patton’s Model 2160 series of auto-rate Ethernet Extenders open the door to low-cost and easy set-up LAN extension. 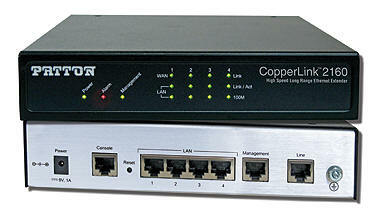 The LAN Extenders are easy to use and take advantage of existing copper twisted-pair infrastructure to connect LANs at high speed and over long distances. There are three models available in the 2160 series, including the flagship Model 2162 that utilizes 1 to 4 pair of voice-grade wires enabling maximum transmission speeds of 22.8 Mbps at a distance of 1.6 miles (2.6km). Also available is the Model 2161 (4 wire)—11.4 at 1.6 miles (2.6 km), and the Model 2160—5.7 Mbps at 1.6 miles (2.6 km). Maximum distance achieved with all CopperLink 2160 models is 4.1 miles (6.6 km). Whether connecting corporate LANs or remote offices, Patton Ethernet Extenders offer the best combination of speed and distance in the industry. Other LAN extenders operate at a single rate or are difficult to configure for LANs located at different distances, but the CopperLink Ethernet Extenders’ auto-rate adaptation feature ensures that users get the highest speed possible for the distances they are trying to reach. Patton Ethernet Extenders include MTU support of 1,792 bytes and come with a built-in MDI-X switch, that simplifies connection to LANs or PCs since it works correctly with a straight-through cable or a cross-over cable. The set-up is easy, just connect the Ethernet port cable and the copper twisted-pair to the Extenders, then apply power! Patton CopperLink Auto-rate Ethernet Extenders are the perfect fit for cost-effective simple and efficient LAN extension!